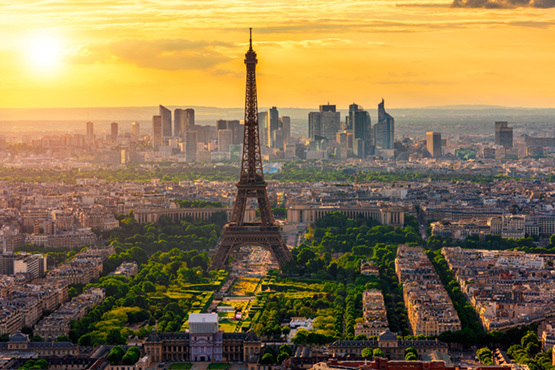 Experience Rome, Milan, Zermatt, Geneva and Paris – «the City of Lights». During 9 days you will explore top destinations of three countries. The journey begins in Rome with over 2000 years of history and highlights such as the Vatican, the Colosseum and the Roman Forum. In Milan, the fashion mecca and a real shopping paradise await you, before you take the train to the Swiss mountains to Zermatt at the foot of the most famous mountain, the Matterhorn. After the cosmopolitan Geneva awaits you at the end of this impressive journey Paris, the most popular tourist destination in the world. Arrive in Rome by flight. Transfer to your hotel. Why not take a city tour in the afternoon to get an overview of this fascinating city? Rome is not only the capital of the state, but also home to the Vatican City in the middle of the city. This is where the spiritual leader of the Catholic Church, the Pope, lives and works. Speaking of God: You love ice cream? In the Gelateria Giolitti over 100 different varieties of ice cream await you – simply divine. Overnight in Rome. Train ride to Milan, which is well known for shopping and cultural highlights such as the Cathedral or Leonardo Da Vinci's world-famous image «The Last Supper». Overnight in Milan. Train ride to Zermatt via Brig. Stroll through this charming village. Zermatt is just as you imagine a Swiss mountain village with the most famous mountain in the world in the background, the Matterhorn. Try the world-famous cheese fondue, the Swiss national dish and spend the evening in one of the many lively bars. Overnight in Zermatt. We recommend a hike in the fantastic mountains or a trip with the popular Gornergrat Bahn. Europe’s highest open-air cogwheel railway takes you up to the Gornergrat. On the viewing platform you are surrounded by 29 peaks rising to above 4000 m. Overnight in Zermatt. 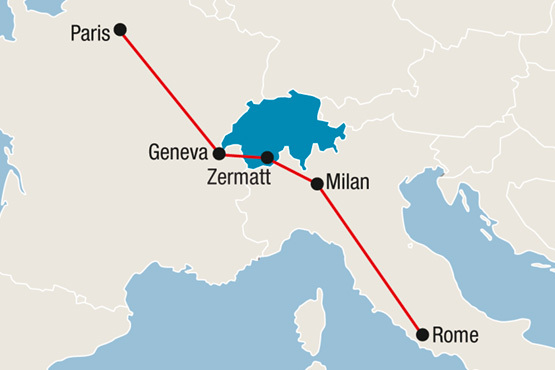 Depart Zermatt by train for a short ride at the shores of Lake Geneva. Make a stop at Lausanne and visit the famous Olympic Museum and even the new Chaplin’s World in Vevey. Overnight in Geneva. Depart Geneva by high speed train TGV. In just about 3 hours you arrive at Paris. Why not take a trip to charming Montmartre, home to artists and cabarets like the Moulin Rouge? Overnight in Paris. After the breakfast transfer from your hotel to the airport and end of the journey. Combine your trip to Italy, Switzerland & France with any Package in Switzerland, i.e.